Bob Vila answers your questions about replacing faulty faucets, modifying light fixtures, and tiling over concrete. To submit a question, visit our Forum Section. When I turn on the water in the bathtub and pull the plunger so that water redirects to the shower, a lot of water still comes out the faucet. I’m guessing that there’s a stopper of some sort that needs replacing? Are they pretty standard and easy to buy in the local hardware store? Its true that replacing the component parts of plumbing fixtures can save you money, but in your individual case, replacing the entire faucet is probably necessary. The good news is that faucets are inexpensive and sold by hardware stores everywhere. To install your replacement, fist remove the old faucet. It will be one of two types, either a set screw or a screw-on. A set screw faucet comes off when you by unscrewing the tiny screw beneath. If there is caulking, cut it carefully with a utility knife and scrape away the rest once you’ve got the faucet loose. A screw-on faucet, meanwhile, might be removable by hand; try rotating it counterclockwise. 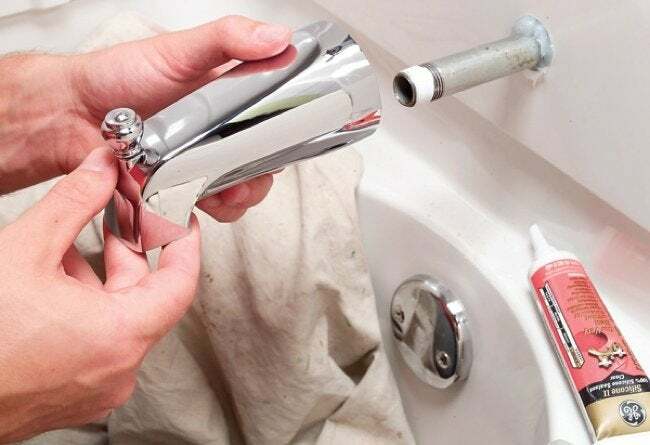 Failing that approach, insert a long screwdriver into the faucet opening, using the tool for strength and leverage as you twist the faucet out of its installed position. Now it’s time to put in your replacement. Installing a new set screw faucet simply means sliding it onto the pipe and tightening the screw. If you’re installing a screw-on faucet, be sure to wrap teflon tape around the threads before tightening the fixture into place. I always cautions do-it-yourselfers to be wary of the risks involved in electrical projects. Know your limitations and when in doubt, hire an electrician. That said, it’s actually pretty easy to modify a hardwired lighting fixture so that it plugs into a wall socket. The easiest way to proceed is with a swag conversion kit (or a plug replacement kit). 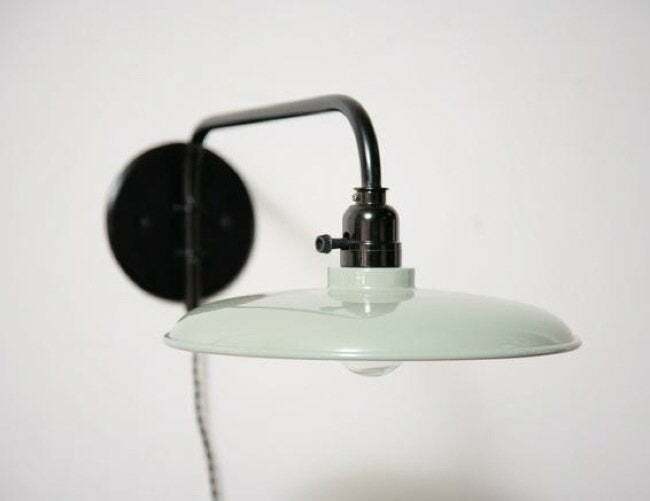 Most of the time, all you need to do here is find the wires peaking out of the back of your lamp, connect them to your chosen kit, and then plug in your newly converted fixture. Here’s the wrinkle: These kits often have two wires, not three, so if you’re converting a fixture that has a ground (a third wire, either bare or green-sheathed), a different approach must be taken. Get ahold of a grounded extension cord (with two flat plugs and one rounded peg); most likely, you already have one laying around. Use wire cutters to remove the outlet portion of the cord, then strip the casing to reveal the three wires within. Connect the wires to your lighting fixture, matching white to white and black to black. Join the bare or green-sheathed wire from your lamp with the extension cord’s green wire to establish the ground properly. Use screw nuts to keep the wires connected, and secure the assembly with electrical tape. Consider cord molding (which attaches to the wall and can be painted) as a way of hiding the spliced wire. I would like to know the proper way to put flooring on a concrete floor. The floor sweats when it is hot. I am thinking about porcelain tile. Can I just seal the floor or do I need to put down subflooring? There are two scenarios in which a cool concrete floor sweats: When moisture rises from beneath the slab, or when warm, moist air passes over the slab, causing condensation. You can easily determine the case in your home by looking beneath any object sitting directly on the floor. If the bottom of the object is wet, then moisture is rising from below, and you should use a waterproofing concrete sealer prior to tile installation. If the bottom of the object is dry, then your moisture stems from condensation and may return after tiling is complete, since even then, your flooring will still be cooler than the warm, moist air surrounding it. Having addressed moisture concerns, you can go ahead and install your tile directly over the concrete. 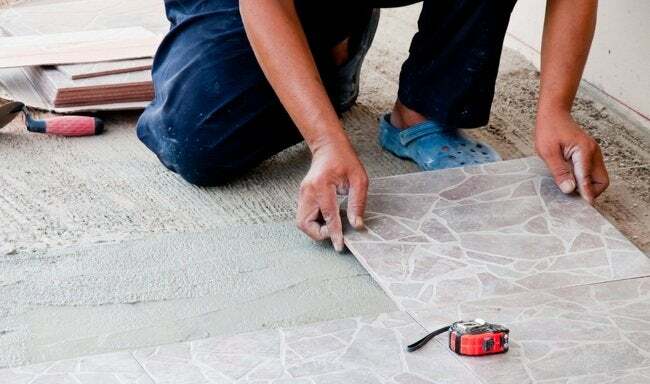 In preparation, level the floor by using concrete patching compound to repair any cracks or damaged areas, then clean the surface thoroughly with a product like TSP. One other thing you can do before tiling, something I recommend, is lay down an uncoupling membrane between the two materials. This padding not only provides insulation and a vapor barrier, but it also protects the tile and grout in the event of a shifting or cracking concrete slab.